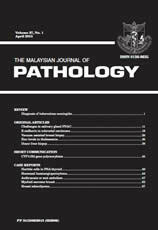 Donor biopsy in living donor liver transplantation: is it still relevant in a developing country? Hurthle cells in fine needle aspiration cytology of the thyroid: a potential diagnostic dilemma? A fire death with a rare finding: anthracosis or soot embolism?